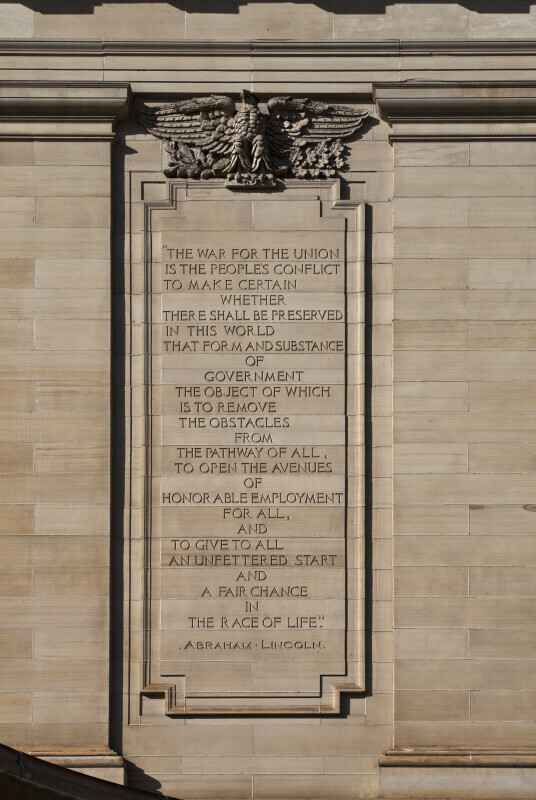 An engraved passage on the wall of the Soliders and Sailors' Memorial Hall, featuring a quote by President Abraham Lincoln. "The War for the Union is the people's conflict to make certain whether there shall be preserved in this world that form and substance of government the object of which is to remove the obstacles from the pathway of all, to open the avenues of honorable employment for all, and to give to all an unfettered start and a fair chance in the race of life." The hall is located in Oakland, Pennsylvania, and was dedicated in 1910, recognizing and honoring all soliders who have served in the United States military throughout history.